Our Primary and Secondary teacher training courses prepare top graduates for a career inspiring learning and transforming lives. Our teacher training courses work in partnership with a wide range of primary and secondary schools, sixth form colleges and special schools, across Birmingham and the surrounding authorities, to offer both core and School Direct routes for teacher training. The University of Birmingham is delighted to award a travel grant of £150 to all general primary students on our PGDipEd and School Direct programmes (excluding salaried trainees). This will be awarded to all successful applicants and will be available at the start of the programme. 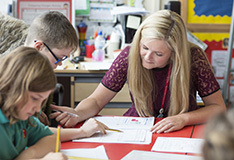 After you have finished one of our teacher training courses and have been awarded your QTS, the University of Birmingham will continue to support you during your first year as a Newly Qualified Teacher (NQT). Find out more about our resources, opportunities and events. Find out more about opportunities we offer to support your career development after you have completed one of our teacher training courses, as a newly qualified teacher as well as opportunities for pupils to explore the world of higher education. We now also offer a number of PGCE programmes on our campus in Dubai.